Regular hospital environments can seem even scarier and more intimidating to children than they do to adult patients. 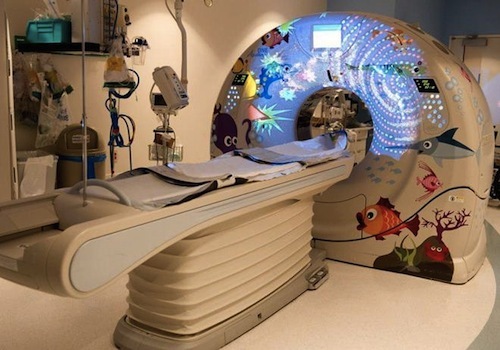 That’s why lots of pediatric hospitals around the world are swapping their sterile corridors for colorful fantasy-themed designs plus fun characters and games that distract kids and allow them to escape. 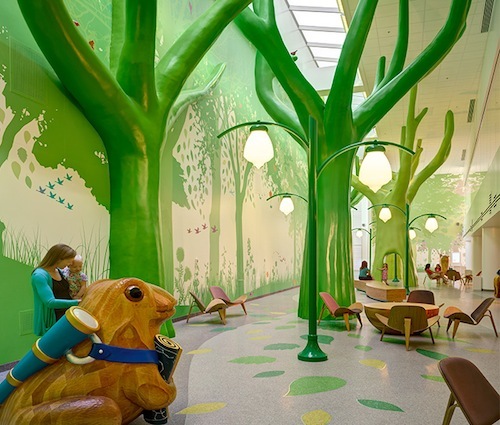 Featuring everything from magic forests to shark-filled fish tanks, here are ten incredible children’s hospital designs that aim to put a smile back on young patients’ faces. 10. Dell Children’s Medical Center – Austin, Texas, U.S.A.
Dell Children’s Medical Center in Austin, Texas has been called “breathtaking.” Thanks to playful additions like a giant guitar in the main lobby, an interactive donor wall, and assorted artwork with “healing power,” the hospital provides its patients with a truly engaging atmosphere. The centerpiece, however, is the multi-level healing garden, which stretches over three acres and includes a labyrinth, an outdoor movie theater, a human sundial and a bubbling waterfall. In 2008 Dell Children’s Medical Center became the first hospital to be awarded the Leadership in Energy and Environmental Design (LEED) Platinum Certification. And adding to its fun credentials, the hospital also features a train station-themed specialized area for the Childhood Cancer and Blood Disorders Program. 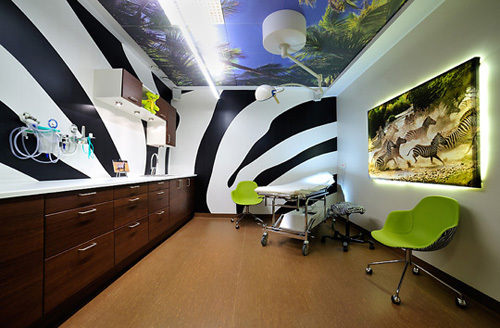 With its playful decor and design, Queen Silvia Children’s Hospital in Gothenburg, Sweden aims to whisk children away on fun jungle safaris during their visits to its examination rooms. You see, Swedish design agency BrittaBritta conceived jungle-themed exam rooms and other spaces for the hospital’s emergency department. And when patients are ready for fun instead of tranquility, the hospital also has playrooms, table tennis and even a music studio. The wide selection of entertainment and distractions on offer is the result of tireless fundraising efforts. One fundraising initiative involved patients shaping donation-request letters into “cootie catchers,” paper planes and footballs, before they were delivered to prospective donors. The result? A 320 percent increase in donations. 8. Evelina Children’s Hospital – London, U.K.
Evelina Children’s Hospital in London, England is an architectural wonder. In 2006 the hospital won an Institute of Structural Engineers’ Structural Award in the Educational or Health Structures category. The atrium of the hospital is enclosed almost entirely by glass, which lets in an abundance of natural light. Elsewhere, the hospital benefits from Radio Lollipop, which is a charity that arranges entertainment and visits for children in hospital while also broadcasting exclusive programming for them. And when they’re not listening to the radio, patients can watch movies at the on-site cinema – provided by charity MediCinema – which features a big screen, Dolby Surround Sound, and easy access for kids in wheelchairs and even in beds. Previously, the hospital even showcased a cool helter skelter for patients to enjoy – although it’s sadly no longer there. 7. Texas Children’s Hospital – Houston, Texas, U.S.A. The Texas Children’s Hospital – the biggest children’s hospital in the U.S. – is part of the Texas Medical Center in Houston. 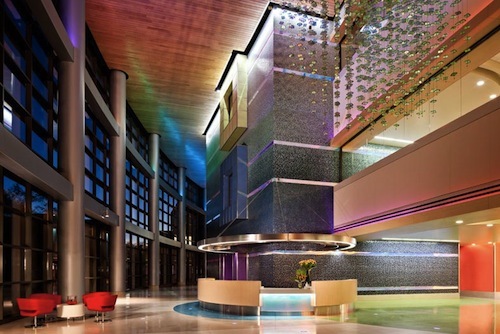 This hospital contains aquariums, two-story play apparatus, art-filled hallways, and bustling play areas. One of the hospital’s patients, eight-year-old Christopher Astudillo, took fun to a whole new level during his stay in May 2011. Admitted for acute myeloid leukemia treatment, Christopher played Frisbee, football and basketball in the halls and even made Play-Doh volcanoes. He invented his own game, too: “Chris Chemo Wars,” which involved him drawing cancer cells on paper and shooting them with paint-filled “chemo” syringes. The hospital also features a Child Life Zone, an area in which patients can play games and forget about their illnesses for at least a few moments. Like London’s Evelina Children’s Hospital, Texas Children’s Hospital boasts a Radio Lollipop station, which is programmed by the youngsters themselves. 6. 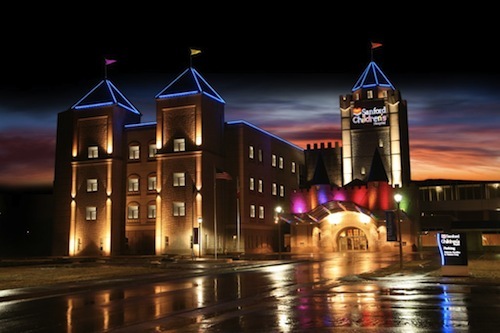 Sanford Children’s Hospital – Sioux Falls, South Dakota, U.S.A.
5. Phoenix Children’s Hospital – Phoenix, Arizona, U.S.A. According to Dallas-based architects HKS – the firm behind this bright and colorful place – the Phoenix Children’s Hospital in Phoenix, Arizona draws its inspiration from a desert flower blooming at night. 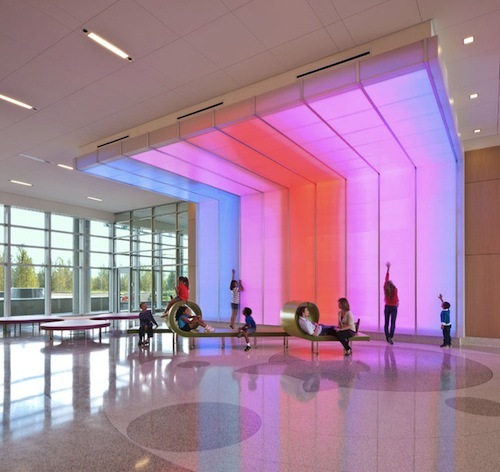 The exciting interior, which includes vibrantly colorful fixtures and an eye-catching “wall of water” – in fact made from light – serves both to entertain patients and make them feel at ease. The hospital also contains a Child Life Zone, a 3800-square-foot play area featuring a multi-purpose theater, a gaming wall, pool tables, pinball machines and air hockey, and a studio that allows youngsters to create programming for the hospital’s private television network. 4. Nemours Children’s Hospital – Orlando, Florida, U.S.A.
Nemours Children’s Hospital in Orlando, Florida is filled with cool elements – such as a saltwater fish tank, supplied by SeaWorld, on the ground floor. The hospital also features animal-assisted activities, whereby highly trained dogs are allowed to visit young patients, inevitably bringing smiles to their faces. Fun and vibrancy at the hospital is enhanced by two rooftop terraces, which include obstacle courses and pathways to explore, and a sense-based “discovery garden” complete with sweet-scented flowers and xylophone benches. Patients can also pick their own custom room colors; six-year-old Timber Branagan opted for a purple-lit ambiance at night, even though she “loved them all.” The hospital’s design and floor-to-ceiling windows in rooms allow sunlight to flood into the building, which a recent study has suggested improves patient wellbeing. 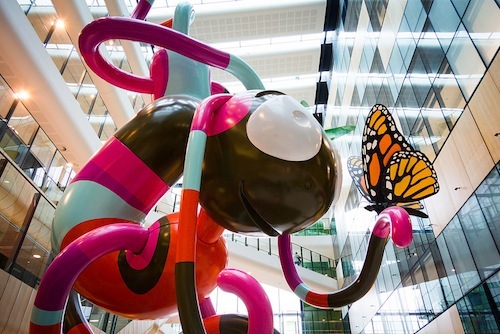 The Royal Children’s Hospital in Melbourne, Australia is no ordinary children’s hospital. This US$903 million (AUS$1 billion) project boasts a six-story atrium and light-filled “Main Street” area, featuring a giant public aquarium with three sharks and around 40 fish species, interactive video screens, exhibits by notable Australian artists, and a meerkat enclosure looked after by Melbourne Zoo. But the centerpiece of the Main Street area is “Creature,” a 45-foot-tall sculpture by artist Alexander Knox comprising an array of organic shapes and colors. The hospital also features a tapestry entitled “The Games Children Play,” which illustrator Robert Ingpen crafted to promote the importance of art in a hospital environment and to provide a fun distraction for the patients. 2. 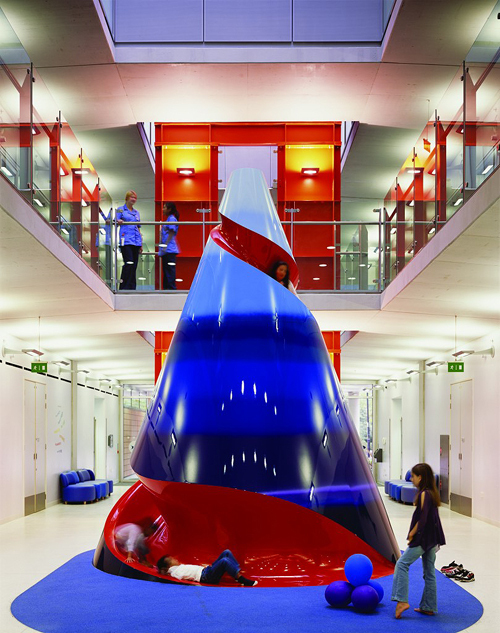 Royal London’s Children Hospital – London, U.K. Whether you’re a patient at or simply a visitor to Royal London’s Children Hospital in London, you’ll almost certainly meet Stan the Rabbit, owls Tweet and Twoo, and Eddie the Tiger. 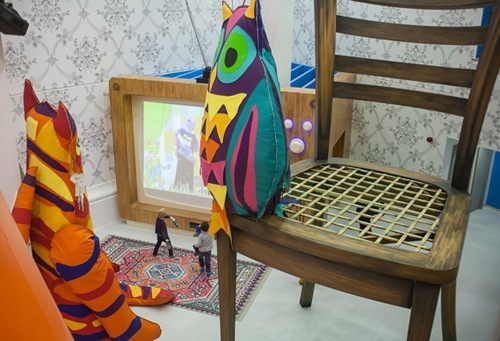 These fun-loving mascots hang out in the hospital’s jumbo living room-style play area, the Ann Riches Healing Space, which also features an oversized chair and popular interactive experience Wiggle Wood. 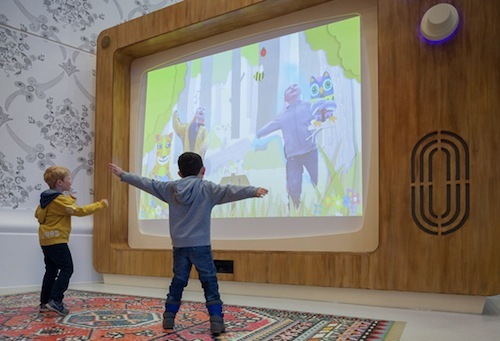 Wiggle Wood is an installation that lets kids use movement to get involved in a storybook world projected onto a giant television screen. In the game, children can paint, play music, and even activate sun, snow and rainbows with various animated characters in a series of fun landscapes. And if kids grow tired of the play area, they can always head to the roof terrace, where a treehouse, canvas teepee and arbor offer a potentially more relaxing experience. 1. Nationwide Children’s Hospital – Columbus, Ohio, U.S.A. Prepare to be whisked away by the magic forest of Nationwide Children’s Hospital in Columbus, Ohio. Designed as a fun escape for patients, the forest includes two-story fabricated trees, woodland “creatures,” vibrant wall graphics, and a café. Nurses on the clinical therapy floors even use the prospect of visits to the forest to motivate their patients. In addition to the hospital’s playful interior, there is an engaging outdoor area marked by a six-acre park that boasts both a maze and a fragrance garden. And should children fancy something more educational, there are discreet computer stations and educational spaces distributed around. 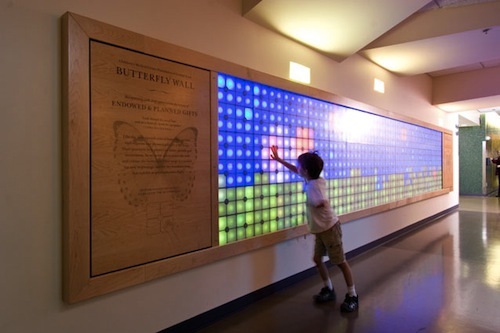 Kids are also treated to fun features in their rooms, where they can control the glow and color of the walls with the touch of a button. Can I Do an MHA Online? Many potential students feel that they do not have the opportunity to pursue higher education because of time constraints or location. Professionals who have obtained an undergraduate degree may be working during the hours that courses are offered at a local university. Anyone who would like to pursue a Master of Healthcare Administration (MHA) degree can opt for an online MHA degree to enjoy the benefits of a flexible program. The University of Cincinnati outlines the similarities of on-campus and online learning programs. Any degree program requires students to commit a lot of time and effort to the pursuit of higher education. Online universities also offer contact opportunities between professors and students. There are differences between online and on-campus degree programs that should be mentioned. Online courses do not require students to attend classes at any particular time. Flexibility is a major benefit for online students, but coursework must still be completed by a set deadline. Technology including an Internet connection and a computer must be used to access online classes. Some people struggle with online courses because of the personal discipline that is required of students pursuing this type of education. Many people believe that pursuing an online degree will limit their ability to find a job after graduation, but U.S. News and World Report explains that employers now tend to view online degrees as an equivalent to on-campus degrees. The high standards of online universities and accreditation are reasons for employers to accept degrees from online academic institutions as a qualification for a position. Many universities offer online MHA degree programs. Some universities are completely online. There are also traditional colleges that provide online learning opportunities. Use MHA Programs to learn more about the online MHA programs that are available. It is important to remember to search for an accredited program when searching for an online MHA degree program. Programs that are not accredited may not provide the same quality and value as universities that take the effort to receive accreditation. Employers are more likely to accept online degrees that come from an accredited university. Potential students who think that an MHA degree program cannot fit into their busy schedule can benefit from pursuing an online program. Employers typically view online degrees as equivalent to traditional degrees as long as the university that the program was completed through has been accredited. Obtaining a Master of Healthcare Administration (MHA) is an admirable goal that offers the possibility of landing a job in the field after graduation. Salaries for available positions vary widely, but most people who are working in the field of healthcare administration are able to bring in a comfortable living salary while working full time. People who choose to pursue an MHA degree may expect to work as a healthcare administrator after graduation, but there are actually many other opportunities available to people who have this degree. Healthcare administrator is just one position that can be obtained by a person who has an MHA degree. Georgetown University notes that healthcare administration can cover many different administrative areas within a healthcare organization. Administrators can concentrate on a specialty including patient care, finance, human resources or marketing. People who have a background in nursing may be able to use an MHA degree to obtain a position in nursing administration. Bellevue University in Nebraska outlines some of the specific job titles that a graduate can expect to have after obtaining their degree. Examples include patient care coordinator, clinical manager, healthcare consultant and director of radiology. Healthcare administrators can work in any healthcare facility. According to the Bureau of Labor Statistics, people who have an MHA degree can work in hospitals, nursing homes, offices of physicians and outpatient centers. These settings can offer routine or emergency care to patients, and work hours of healthcare administrators depend on the office hours of the healthcare facility in which they work. Anyone in a healthcare administration position can expect to be responsible for keeping the daily operations of a healthcare facility running smoothly. Typical tasks required of these professionals include writing schedules for other professionals, complying with healthcare regulations, evaluating the efficiency of a facility and keeping the lines of communication open between doctors, nurses and patients. The salary for people who hold an MHA degree tends to be higher than the national average for all jobs. Healthcare administrators make between $51,280 and $144,880. The median salary for people who work in managerial positions in healthcare administration is $84,270. People who manage a higher number of people can expect to be paid more than healthcare administrators working in small offices. The median salary for an administrator in a managerial position in a practice of 26 or more doctors is $150,756. While there are opportunities to make six-figure salaries in the field of healthcare administration, it is important to be aware that professionals who make these high salaries often work in hospitals that are open at all times. These professionals may be required to work nights, weekends and overnight shifts. Job growth for people who hold an MHA degree is expected to increase at a rapid rate of 22 percent between the years of 2010 and 2020. Salaries are high for these professionals, and job stability in healthcare administration is better than average. Enrolling in an MHA program in the first step to becoming a successful healthcare administrator. How Do I Pay for an MHA? Paying for any academic program can be an overwhelming task. While there are loan programs available for graduate students, amassing a large debt before graduating from college is never a good idea. There are several options for financing a Master of Health Administration (MHA) degree program without relying completely on one source of financing. The issue of paying for graduate school has been raised by millions of students across the country. Concerns related to financing an education have been answered with tips from leading business publications in the United States. The Wall Street Journal outlines average yearly financial aid amounts to help graduate students decide which schools they can afford. Master’s degree programs typically offer between $7,000 and $7,300 in financial aid. Private loans, scholarships and savings can help fill in the gaps left behind after this financial aid is applied. U.S. News and World Report provides unique tips for financing an education. Some employers may be willing to pick up a portion of the tab if employees are pursuing an education in a related field. Students who want to pursue an MHA may be able to get an employer to pay for tuition if they are employed in the healthcare field. Fellowships that allow students to receive a reduction or even complete forgiveness of tuition are available at some schools. Discuss these options with an admissions representative to learn more. Scholarships are available for students who wish to pursue an MHA degree. The Association of University Programs in Health Administration (AUPHA) offers nine different scholarship programs that award students up to $40,000 for tuition, fees and other academic expenses. Some students are eligible for scholarships through academic diversity programs. The Institute for Diversity allows healthcare management students to apply for scholarship programs once per year. Students should also research scholarship opportunities at their university of choice. Many schools offer unique financial aid opportunities that are only available to students who have been accepted into an MHA program. Paying for an MHA may be a matter of adjusting the list of schools to apply to in order to include only the schools that fit into a budget. Online schools often offer lower tuition that on-campus programs, but remember to read the fine print to learn about fees before applying to a program. An unconventional method for making an MHA program more affordable is negotiating tuition. This technique is typically reserved only for students who have an outstanding academic record or work experience. Students who are desirable to a university may be able to receive a discount on tuition by talking to an admissions representative. Paying for an education at any level can be a struggle, but most jobs in the United States require a candidate to hold a minimum of a bachelor’s degree. People who wish to pursue a graduate degree in healthcare administration can research scholarships, fellowships and benefits from employers before enrolling in a program. Why Earn a MHA Degree? People who currently work in the field of healthcare may want to become eligible for a promotion by pursuing a Master of Healthcare Administration (MHA). Business professionals who are interested in healthcare administration can open up new opportunities by pursuing higher education. The personal satisfaction that comes from helping others access the healthcare that they need is often cited as a primary reason for entering the healthcare administration field. Healthcare workers often feel that they reach a point in their career where they cannot advance in an organization without higher education. Administrative professionals in a healthcare setting may be stuck in secretarial positions because of their lack of education. Pursuing an MHA degree program can be the key to getting ahead in a healthcare facility. Des Moines University reminds potential students that most managerial positions in a healthcare setting require a person to have an MHA before they can be considered for the position. An MHA program can also prepare a student who has a background in only healthcare or business for a career that combines both of these disciplines. McGraw-Hill notes that the job prospects for people who have an MHA are very good. Fields related to healthcare administration are expected to grow rapidly. There may even be a shortage of available employees if more students do not choose to pursue this valuable degree. The potential to earn a generous salary is high for people who have an MHA. It is not uncommon for healthcare administrators who manage facilities to make six-figure salaries. Financial compensation and job stability are certainly at the forefront of a person’s mind when an MHA degree program is being considered, but helping people on a daily basis is the benefit of pursuing this degree that leads to job satisfaction and personal happiness. Healthcare administrators are tasked with evaluating the operations of a hospital or other facility in order to improve the care that patients receive on a daily basis. Doctors and nurses receive guidance from administrators to help them provide the highest quality of care possible. Healthcare administrators who work in a position related to public health can help low-income individuals access much-needed healthcare services. Preventative care that some people may not be able to find without the assistance of a healthcare administrator can prevent or delay serious health conditions. MHA degree programs can be completed in a traditional campus setting or online. Degree requirements vary from one school to another, and the length of the program is approximately two years. Pursuing higher education to open up new job opportunities and become qualified in a field that is interesting to an individual is an admirable goal.